For most of us the dead of winter is now over. The days are gradually getting longer with more light but for many of us it’s still colder than we would like. While most of us have been spending more time indoors VPN providers have been busy upgrading their infrastructure, introducing new features, perfecting their clients and much more. It’s time to do a round up of the latest VPN news for February 2016 so you can keep abreast of the goings on in the privacy and encryption world which should ultimately help you make a decision when it comes to purchasing a VPN service. It’s worth noting this month that Netflix started to crack down on VPN services that enable access to other regions movie content yet all of the leading VPN providers such as IPVanish, StrongVPN and others have rectified this issue and as of publishing it’s still possible to access all regions of Netflix with one Netflix account and a VPN service. It’s also worth mentioning that Paypal is NOT cracking down on VPN or SmartDNS services specifically but instead are targeting providers who market their services directly as a way to bypass entertainment geo-restrictions. See our full article for more information and don’t believe the hype of the big news outlets. So without further ado let’s find out what the VPN providers have been up to in February. Often Mac clients are overlooked but one of the smartest and easiest to use Mac VPN clients has had an upgrade. StrongVPN this month released their updated Mac client v1.6.0 which rectified some issues and made navigation even easier than before. Login, Screen Navigation, Preferences and other Menu options have had the once over and all been updated to offer an improved user experience. One of the most important and time saving features is the new Login system that allows you to save your login details on the Mac client, if you haven’t actually got a StrongVPN account then you can now sign up seamlessly via the login screen of the software. 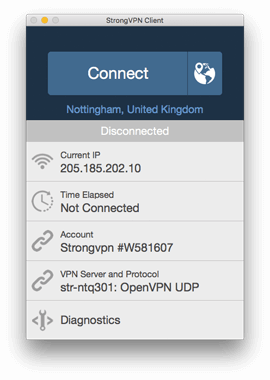 The overall interface of the StrongVPN client has been updated and improved which makes it easier to navigate to connect to the VPN service, change your options and understand what protocols and settings you’re using. The preference area of the Mac VPN client has been redesigned to make protocol selection easier. Alongside this update is the ability to select servers based on protocols supported making your usage experience easier. If you’re interested in taking advantage of the improved StrongVPN Mac client or want to sign up for the service for another device, follow the link below. Another provider making improvements to their Mac offering are ExpressVPN who this month launched the latest version of their client. ExpressVPN already had a pretty robust Mac client and as the old saying goes, “if it ain’t broke, don’t fix it”. What ExpressVPN have done to their Mac client is to improve the visuals and make your user experience more pleasant. The new interface makes it clear when the service is connected and when disconnected. This will help the novice user understand when their connection is secure and when not. To take advantage of the sweet new Mac client or the ExpressVPN service for other devices, follow the link below. If there was an award for a VPN service that seriously undersells itself then VPN.ac would be the winner of that ten times over. One of the most privacy conscious VPN providers with often the fastest and most robust network slips out updates and improvements without even uttering a word. In fact, they’re so stealth about their improvements we’re not sure all these new server additions actually happened this month but our radar finally picked them up and so I’m including them in our February news roundup. VPN.ac welcomed new servers in Spain, Italy and Finland taking their total country count to an impressive 18. So bad VPN.ac are at self promotion even their website doesn’t list these new additions. Thankfully their service is top notch and what they lack in self promotion they make up for by being one of the top VPN services on the market. At as low as £3.38 ($4.90) per month the new additional servers open up the service to tons more users. If you’re interested in checking out this high privacy, poor self promotion provider just click the link below.